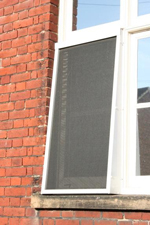 Our comprehensive range of window insect screens consists of roller screens, sliding screens, hinged screens, fixed screens and lift off screens. This wide selection of screen types together with a variety of mesh fabrics and profile colours means we will have the perfect insect screen for all commercial environments. A popular retractable window screen and perfect for PVC window installations as it retracts neatly out of sight when not in use. Slimline 36mm x 43mm rounded extruded aluminium cassette. Tensioned cassette to keep the mesh taught. 30mm x 22mm extruded aluminium side channels. Handles on the pull bar. Concealed catches inside each side channel. Available with stiffened Fibreglass (18 x 16) charcoal mesh. Available with a spring loaded handle mechanism which allows the screen to be stopped at any pre-set height position. Can be reveal or face fitted as required. 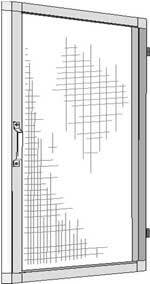 A more robust retractable window screen which is suited to light commercial use. As with the Unika 36, this screen will retract neatly out of sight when not in use. Compact 46mm x 46mm extruded aluminium cassette. 40mm x 22mm Extruded aluminium side channels. Simple side chain operation (supplied with child safety device). Single surface mounted PVC handle on pull bar. Stiffened fibreglass (18 x 16) charcoal mesh. Re-enforced pull bar profile available. Fibreglass (20 x 30) solar protection mesh available. Tuffscreen (17 x 13) Petmesh available. Perfect for commercial kitchen installations. 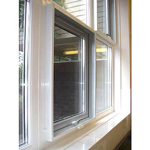 The robust design is very simple to use and all inner panes are easily removed for cleaning and maintenance purposes. Designed for reveal fitting only and will outlast any retractable roller screen available. 4 sided 49mm x 13mm extruded aluminium outer frame. 2 robust equal size inner panes. Inner pane easily removed for cleaning and maintenance. Available with 2, 3 or 4 panes. Fibreglass (18 x 16) charcoal mesh. Powder coated profiles white or brown as standard. Custom colours available to special order. A less expensive option to the Easy sliding window system but still suitable for light commercial use. This design includes PVC top & bottom sliding track only with two or three sliding inner panes which are easily removed for cleaning and maintenance purposes. Available with 2 or 3 panes. Powder coated profiles white as standard. Designed for reveal fitting only. Available as hinged, lift out turnbuckle and fixed versions, this framed system is primarily designed for commercial face fitting installation only. Available as hinged, lift out, turnbuckle and fixed. Central mid bar for added support (where applicable). Removable lift off hinges (hinged system). Magnetic catch closer (hinged system). 4 secure sliding locking catches (lift off system). Robust impact resistant PVC corners. Powder coated white or brown frame standard. 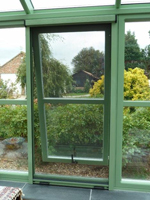 This 35mm stand-off framed system is primarily designed for face fitting to most modern PVC window installations. This system is simple to use, clean and will outlast any retractable roller screen available. Available as hinged and fixed. 35mm x 28mm extruded aluminium frame. Special design stand-off PVC corner pieces. This traditional lightweight framed system is primarily designed for light commercial face fitting installations. 26mm x 12mm extruded aluminium frame. Mid bar for added support (where applicable). Special design PVC corner pieces. A popular lightweight framed system with discreet 19mm x 12mm frame which is primarily designed for light commercial face fitting installations. Available as hinged, fixed and turnbuckle. 19mm x 12mm extruded aluminium frame. 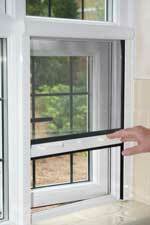 A popular lightweight framed system for older style wooden windows that have a latch arm to keep the window open. The latch passes through the brush seal when the window is open. Nylon 35mm brush seal along bottom edge of frame.